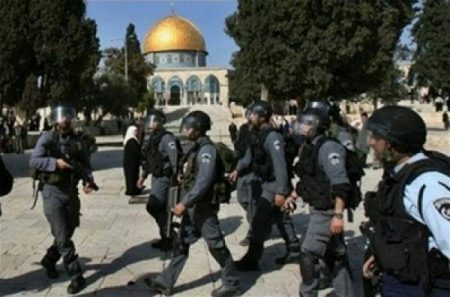 Scores of Israeli extremist settlers, backed by Israeli special forces and rapid intervention troops, broke into the courtyards of al-Aqsa Mosque compound on Wednesday morning. Jerusalemite sources reported that some 51 settlers stormed al-Aqsa via Maghariba gate, and carried out provocative tours in its courtyards where they were met with Murabitin’s protest chants. Al Ray notes that Al- Aqsa mosque experiences, on a daily basis, the storming of Israeli settlers, who perform Talmudic rituals and desecrate the sanctity of the mosque. Israel seeks, through its provocations at the mosque, to promote the temporal and spatial division of the structure and to slowly Judaize Jerusalem.